There’s nothing worse than travelling with little ones and having bits and pieces of various treasured toys, art supplies, or games go missing under seats, down aisles, and everywhere in between. It can make for some very unhappy children and some very stressed out parents. The Fun N’ Fly foldable tray table attachment means you can finally say “Bon voyage!” to this travel headache. Light, durable, and easy to keep clean, the Fun N’ Fly provides a portable, sturdy, and confined surface for your kids to draw, build, and play to their heart’s delight, encouraging imaginative play over screen time. Assembled in just seconds, the Fun N’ Fly attaches to all standard airline tray tables quickly and easily and then folds up again in just seconds into its very own storage pouch. 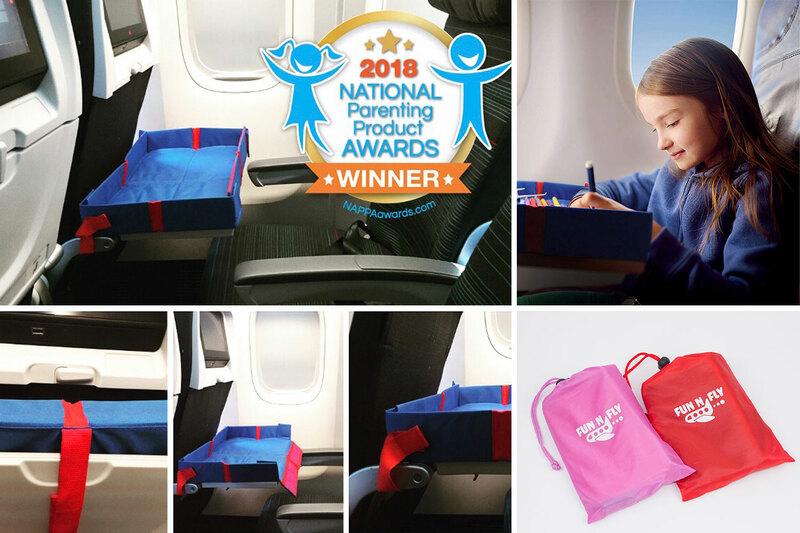 The Fun N’ Fly also features adjustable straps to fit smaller tables, mesh pockets for crayons and pens, a cup holder, and a folding front panel for comfort. The Fun N’ Fly is suitable for children ages 3 and up. Buy Online at Amazon.ca or Amazon.com.